The 1978 classic by British Columbia newspaperman John Willison Green. "The Apes Among Us" is still the best written book on the subject. Written by a veteran Canadian newspaper reporter, it was the first in-depth, journalistic examination of the mystery. Although it only covers incidents up until the early 1970's, it does mention a trove of geographic locations in the U.S. and Canada. The numerous geographic place names and descriptions makes it an essential reference for field researchers today because sightings and tracks still occur in the same areas. 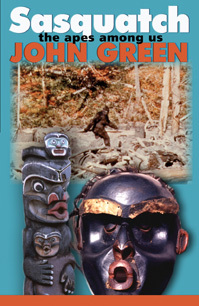 Green began investigating sightings and track finds for the Canadian press back in the 1940's. He wrote more than one book on the subject since the 1960's. This book, his 500 page masterpiece, was last printed 1978. It will be in print again in Spring 2006. For many years most large, public libraries in Canada and U.S.A. had this book in circulation. By the late 1990's, used copies were hard to find among used book dealers. By 2000, copies were bought and sold on E-Bay for more than $300. When that happened, copies in public libraries began disappearing. These days an original copy of the book in a public library is a rare, precious find. To prevent all of them from disappearing from public libraries, the author, along with a small Canadian publisher (Hancock House in Vancouver), recently announced they would re-print the book and make copies available online, as cheaply as possible. Copies will be available in May for about $35, according to the publisher. You will have to contact them to inquire about advance orders. Click on the book cover image, upper right, for the ordering page on the Hancock House web site. From there you can find contact information for Hancock House in Vancouver, BC, Canada.